Rakugo, the art of traditional Japanese storytelling, has existed for over 1000 years. Showa Genroku Rakugo Shinju uses the modern day world of Rakugo to tell a story of love, loss, and tragedy through the life of Japan’s last great storyteller. At first, however, Showa Genroku Rakugo Shinju seems nothing like this. The start of the anime follows Yotaro, a young, low-level yakuza thug who has just finished a stint in prison. But while there, he and his fellow prisoners were witness to a performance by Yakumo—an aged master Japanese storyteller. Now, Yotaro wants nothing more than to be Yakumo’s apprentice. While the first episode follow Yotaro’s first steps on the road to becoming a traditional storyteller, this is just the series’ framing device. The real story is Yakumo’s own. Nearly the rest of the entire anime is an uncut flashback. The only point of the framing device is simply to set up the anime’s overarching mystery—why Yakumo’s adopted daughter Konatsu blames him for the murder of her parents. Yakumo begins life in the 1930s as the son of a geisha. When he breaks his leg and becomes permanently crippled, he is sent to become an apprentice storyteller. There he meets his new master as well as street rat Sukeroku. Soon the prim and proper Yakumo and wild Sukeroku become as brothers, growing up in a world where rakugo reigns supreme. Through the telling of Yakumo’s life, we watch the twentieth century unfold. What starts as a golden age for Japan transforms into one of war, then defeat, and finally reconstruction. 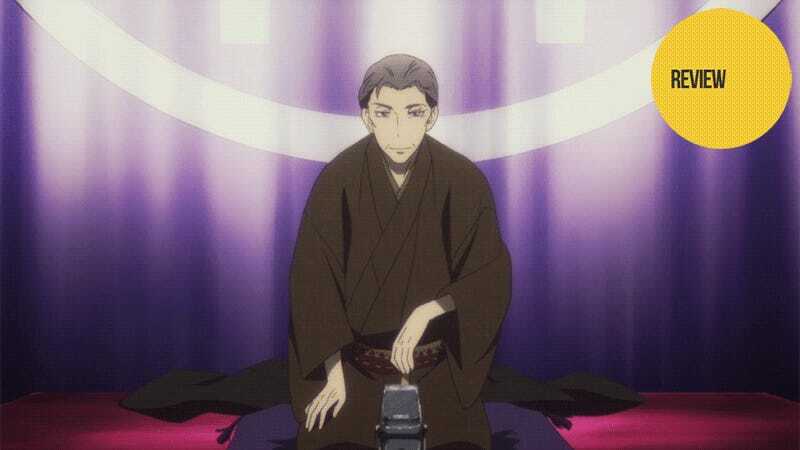 Over this period, we also see rakugo fall from popularity. Before the war, it is a popular form of entertainment. But during the war, discretionary income for many becomes a rarity; and at the same time, many of rakugo’s best and brightest head off to the war, never to return. After the war, rakugo once again finds its footing but is soon challenged by films and, eventually, TV as the dominate forms of entertainment. In the end, only Yakumo and Sukeroku are left from the younger generation. With their art form in decline, Yakumo and Sukeroku vow to reform rakugo for the new era. Yakumo, the proper one of the pair will hold dear all the traditions of rakugo. Sukeroku, as the wild one, will instead be more experimental. In the two of them, rakugo can stay static and yet evolve. Sadly, it’s only the two of them that see rakugo’s decline in this light; the aged masters revolt at the idea of change. And thanks to the framing device, we all already know how this turns out: with Sukeroku dead and Yakumo unable to enact the change that the art so dearly needs. But as much as the anime is about the tragic fall of rakugo in the twentieth century, it is also the personal tragedy that is Yakumo’s life. Yakumo grows up as a man without a true home. As a child to a geisha, he was born and spent his early childhood in a place that, as a man, he could never truly be a part of. After he was left crippled, he was sent off to be an apprentice storyteller—meaning that he could only live there if he devoted himself to rakugo. Because of this, rakugo is not something he wants to do, but rather something that is vital to his survival. Sukeroku, on the other hand, comes from the streets and loves rakugo—wanting nothing more than to become a storyteller. Thanks to this drive, even with his rebellious nature he always outshines Yakumo. Eventually it is the mixture of love and envy he has for Sukeroku that causes Yakumo to truly enjoy rakugo—making it a thing of passion rather than one of necessity. While the two alone could have perhaps saved rakugo from decline, it is the third point of their love triangle, Miyokichi, who causes things to come undone. Miyokichi is a young woman in love with the idea of true love. After following a lover to Manchuria, and being subsequently abandoned by him, she is taken as a mistress by Yakumo’s master while he travels during the war. But upon Yakumo’s master’s return to Japan, she becomes a geisha and soon falls for Yakumo. While she all but showers him in affection, Yakumo knows the truth from the start: Because Miyokichi is “a woman of ill repute,” eventually he will have to chose either her or rakugo, but not both. Eventually, playing the role of traditional rakugo advocate as he and Sukeroku had decided, he breaks it off with Miyokichi. Abandoned yet again but still longing for Yakumo, she settles for the part of Yakumo that lives within Sukeroku. Of course, losing out to rakugo in Yakumo’s heart makes her hate the art form with a vengeance. So when Sukeroku pushes his ideas of reform too far too fast—and finds himself in exile from the rakugo world—Miyokichi convinces Sukeroku to abandon his cause and disappear with her. Miyokichi embodies the old adage that there is a fine line between love and hate. Even though she takes up Sukeroku out of spite—going so far as to have a child with him—she still believes that one day Yakumo will return to her and “true love” will win out in the end. On a meta level, Showa Genroku Rakugo Shinju does more to revitalize rakugo than anything Yakumo and Sukeroku could have planned. The anime proves to be a great introduction to the art regardless of whether you’re Japanese or not. Throughout the series, we are treated to meaty chunks of rakugo being performed on stage. Some of the tales are light-hearted comedy. Others are bawdy, morbid tales. All are strangely captivating—showing that even in anime form, the power of this art is still strong. Showa Genroku Rakugo Shinju is a beautifully told, multifaceted tragedy. It is a historical showcase of Japan throughout the twentieth century. It is the tale of a dying form of entertainment. It is a story of the young and their hope for the future. It is a look at love with all the emotional complexities found in real life. It is an introduction to an art over a thousand years old. Or to put it another way, I’ve watched anime for over 20 years and this is the first one my mother has ever found worth watching. Showa Genroku Rakugo Shinju aired on TBS in Japan. It can be seen for free and with English subtitles in the US on Crunchyroll.